Thank you for your interest in Spooktacular Fun Days. Due to high demand, this event has sold out. *No walk-up tickets will be available at the event. Come one, come all in costume to enjoy a day of fun! 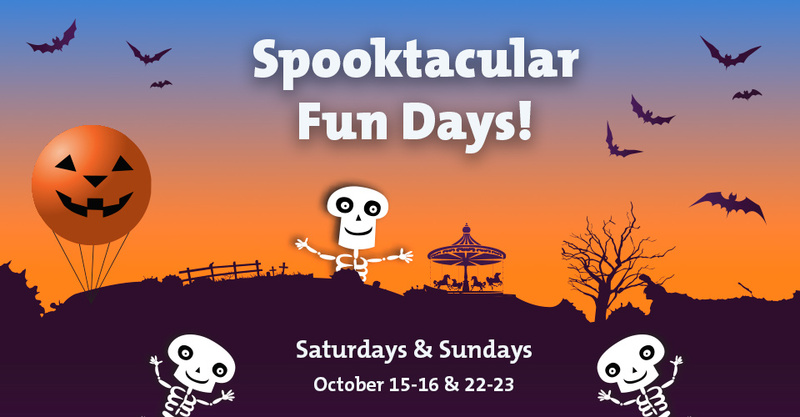 Spooktacular Fun Days is an annual tradition of fall activities for children of all ages. Sign up now! Registration is required for each child (12 & under); space is limited. Free admission and parking. Donate to scare away hunger! Support hunger-relief by having each child bring a bag of canned goods or non-perishable food items to benefit local Orange County food banks. Be rewarded! Each registered child (12 & under) bringing a donation will have access to our free Pumpkin Patch and Trick-or-Treat Town, while supplies last. Have fun! Enjoy traditional family-friendly fall activities including: kids crafts, petting zoo, carnival games, Harvest Walk, entertainment, gourmet food trucks and much more. Activities are for children 12 & under, therefore accompanying adult ticket registration is not required. Follow us on Instagram for sneak peeks of Spooktacular Fun Days! Special event entrance for the Orange County Great Park is located off I-5 or I-405. Exit Jeffrey. Traveling East, Turn Right on Trabuco Road. Turn Right on Ridge Valley. Click here for map. Have more questions? Click here for our FAQ's.